Black Diamond Guide Finger Gloves. The Guide Finger gloves takes BD's warmest, pro-level ski gloves and add a split-finger design to deliver the warmth of a mitt with the dexterity you need for hands-on tasks in the mountains. These gloves are all about warmth. A split-finger design gives the Black Diamond Guide Finger gloves extra warmth while maintaining the dexterity that mountain professionals need for bell-to-bell days. The GORE-TEX inserts ensures total moisture protection while the large gauntlets keeps powder from sneaking its way in through the back door. 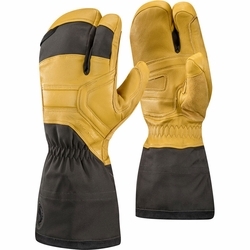 In addition to a 300 g Polartec fleece palm lining, the Guide Finger gloves also features removable liners with PrimaLoft Gold Insulation and boiled wool.